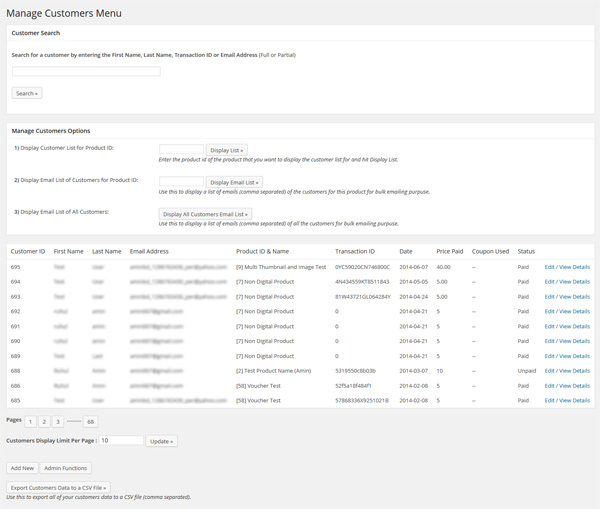 The Manage Customers menu can display a list of all the customers or all the customers who bought a particular product. You can also display a comma (,) seperated email list of all the customers or customers of a particular product which can be used for bulk emailing to deliver important product related updates. Remember you can keep the “Enable Debug” checkbox on in live mode.. it won’t affect anything and your customers won’t see anything different either. Hi Amin, we have had two recent orders for books on our site and neither order/customer shows up in our manage customer screens. Any idea why they are not showing there?